With this new addition, it provides toasted flavor. A change as bold as this comes with a reason. 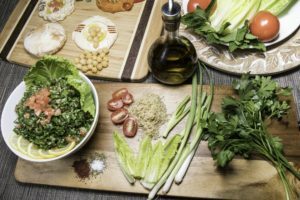 The tabbouleh itself is extra lemony with a sprinkle of feta cheese along with the usual parsley, mint, onions, tomato and olive oil, it proves to be a great Mediterranean salad. Tabbouleh, originally a Lebanese dish, it’s a major salad in the Middle East. Our process is hand chopping fresh parsley, fresh mint, tomatoes, green onions, then adding lemon juice and oil. The benefits to subbing quinoa for bulghur wheat is that it is gluten-free! So to people with gluten intolerance can enjoy this salad with no worries. The texture of the quinoa itself is more delicate than the bulghur wheat. It isn’t as heavy on the mouth or stomach. For the vegans out there, the protein content of quinoa is a great addition. Another plus to subbing in quinoa is how quick it can be cooked, which is in a matter of minutes! Book a table or stop by and try our new Quinoa Tabbouleh!